If your senior furry companion suffers from arthritis or other joint issues, Blue Buffalo Homestyle Recipe Chicken Dinner Senior Canned Dog Food might be the right choice. Blue Buffalo’s wet food is soft and contains glucosamine and chondroitin, two major compounds that are known for relieving joint pain. Lean chicken is the main ingredient. Ground brown rice provides complex carbohydrates. Peas and barley provide your senior canine with energy. The formula contains no wheat so it’s safe for those furry ones with food allergies. Biotin maintains a healthy skin and coat. Chelated mineral in the formula boosts the immune system. The food can be eaten alone or added to dry food as a topper. Just as you would transition your dog’s kibbles, canned food must also be introduced slowly. Mix small portions of the canned food with your little one’s current food. The transition should be for at least one week until your dog has an entire serving of the new food. It is important to transition in portions in order to avoid any digestive issues when changing foods. Blue Buffalo recommends you follow their instructions found on the back of the can. Prior to making any changes to your canine’s diet, you should consult with your dog’s veterinarian. Make sure to have plenty of clean water to keep your little one hydrated. 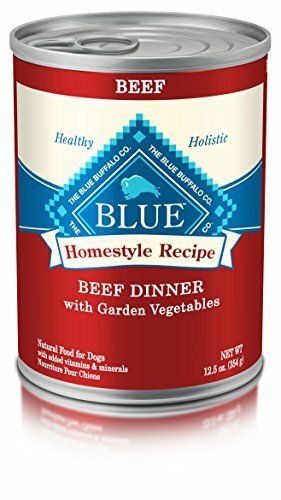 Blue Buffalo Homestyle Recipe Senior Chicken Dinner with Garden Vegetables Canned Dog Food is made with the finest natural ingredients, including but not limited to protein-rich authentic meat. The formula contains no chicken or by-product meals, corn, wheat or soy so the food is safe for senior dogs with a sensitive digestive system. Moreover, Blue Buffalo’s canned pate is catered towards senior small, medium, and large breeds. They are dedicated to making your senior canine’s lifestyle active and healthy. 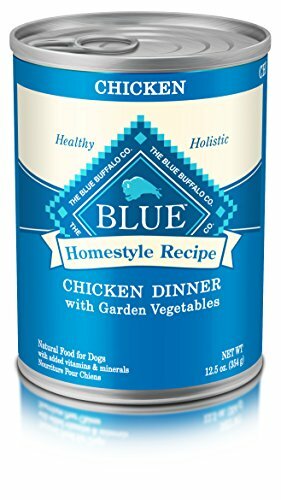 If you have an aging doggie, then Blue Buffalo Homestyle Recipe Senior Chicken Dinner with Garden Vegetables Canned Dog Food may be a good choice for your best friend.